Imagine this: One day you get hit by a truck and, sadly, you die. However, your brain wakes up inside a computer. All of your memories and knowledge are there, but your body is gone. You can think at much faster rate than before, even dividing your brainpower to accomplish complex tasks. To top it all off, you’re equipped with an advanced 3D printer that can make pretty much anything–including copies of yourself–as long as it has a steady supply of energy and raw resources. No, this isn’t Blade Runner 2049 (though it deals with some of the same topics regarding life and AI). 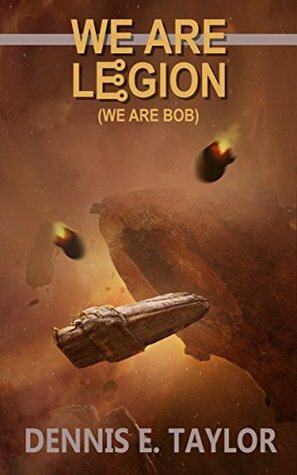 This is a book recommended to me by some readers called We Are Legion (We Are Bob). Minor spoilers ahead. The most fascinating aspect of the book to me is the core concept, though it isn’t really explained until you’re a few chapters in. It’s the way Bob–the person in the computer–is used (yes, he becomes a tool for an organization, but he isn’t controlled by them). Bob’s job is to fly into space, multiply, and find new worlds. He’s able to travel at speeds that would destroy a corporeal human, and the long stretches of time aren’t a problem for him, as he can simply go into sleep mode for days, weeks, or years if he wants to. And perhaps most importantly, he isn’t a construct of artificial intelligence, so he can solve problems and act with empathy as a human would. It’s a fascinating read, and I was so hooked when I finished the first book that I instantly bought and started reading the second book. I think I’ll be hooked on this series for a while (though I’m getting increasingly excited for some upcoming releases, like Brandon Sanderson and Andy Weir’s new books). What would you do if you were a self-replicating computer? Do you have any interest in your mind continuing to “live” after your body dies? This entry was posted on Tuesday, October 10th, 2017 at 8:44 pm	and is filed under technology. You can follow any responses to this entry through the RSS 2.0 feed. Eric: I haven’t read any LitRPG, but I’ll test out a sample of the Aleron Kong series. Thanks for the recommendation!